After reading today's press release, we can give a hint what will go into Samsung's high-end phones from now on. 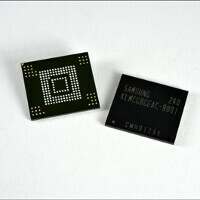 Don't be surprised if the Galaxy S IV and the Note III have versions with super fast 64 GB of internal memory that takes 20% less space inside the phone than the current embedded NAND flash chips. The new high-speed, small form factor eMMC reinforces Samsung's technology leadership in storage memory solutions. We look forward to expanding our line-up of embedded memory solutions in conjunction with the new chip's design, in pursuing a system-level adoption of application processors and other key components that form the foundation for the most advanced mobile platforms. This will allow us to better attend to time-to-market demands enabling the design of more convenient features for next-generation mobile applications. Samsung Electronics Co., Ltd., the world leader in advanced memory technology, today announced a next-generation 64GB embedded multimedia card (eMMC) using 10 nanometer (nm)-class* process technology. The new 64Gb NAND memory went into production late last month. Myungho Kim, vice president of Memory marketing, Device Solutions, Samsung Electronics noted, "The new high-speed, small form factor eMMC reinforces Samsung's technology leadership in storage memory solutions. We look forward to expanding our line-up of embedded memory solutions in conjunction with the new chip's design, in pursuing a system-level adoption of application processors and other key components that form the foundation for the most advanced mobile platforms. This will allow us to better attend to time-to-market demands enabling the design of more convenient features for next-generation mobile applications." Samsung's next-generation 64GB eMMC Pro Class 2000 comes just five months after the company introduced its first embedded memory supporting the eMMC4.5 interface and delivers a 30 percent advantage in performance over that solution. The 10nm-class technology based NAND also is process compatible to Samsung's advanced 20nm-class* 64Gb MLC NAND, which was first available last May, improving manufacturing productivity by 30 percent. Plus, with the carriers wanting to limit your data and charge through the nose for overages ( now that they finally offer enough speed to actually use the cloud), it'll pay to keep as much stored locally as you can. "Space for more things" had better mean the battery or a bone-conduction speaker. I'd like to see THAT in a mass-produced, high-end smartphone. Useless. The current chips are fast enough. And small enough. Exactly. They should work on real innovation, like new types of rounded corners for rectangles. Maybe they should make a parallelogram to avoid the "rectangular" device problem. true. just like your p***s.
Faster, denser and more energy efficient memory. No surprise that it's from Samsung as they've been doing such things for what seems like forever in the computing space. Currently got a set of low profile DDR3 sticks for my desktop. Yeah yeah yeah new technology yadda yadda yadda. Listen Samsung! These things cost you like 5 dollars, so how about starting internal mobile storage from 128GB up to 512? OWN the competition with larger storage out of the box, I mean you want us to believe that cheap $200 netbooks come with hundreds of GBs of storage and you can't put 2 small, cheap 64GB flash memories into a $600 phone? Technology in mobile phones is 22th century, storage however is so 20th. I think you are way off here. Their products are always right there with price/performance. Why do you think they are so succesfull ? I always feel like I get my moneys worth with Samsung products, but maybe I am just a fanboy. No, I'm not way off here. The cost and space flash memory takes is almost non-existent compared to overall size and price of the product, there is nothing competitive in the way these companies rip you off in the name of storage. It is ridiculous that computer alternatives such as tablets start at 16GB, many SD slot free, and you pay hundreds of dollars more to get 48GB more which costs companies a full $15. There's absolutely no way you can defend them bottlenecking highly advanced mobile computers with 1990s storage. Cloud would be a great thing if mobile data wasn't just as badly overpriced. Time to end the nonsense and add proper storage to devices that cost as much as a mid-range full-feature laptops. With hundreds of gigs. You know I'm right. Why do you need half a TB on a smartphone? To forever push the limits of technology. if they came up with 1/2 tb, we'll ask for 1 tb. We should ask for more and they should deliver more. We are already in the terabyte era, so starting at 128 gigs in the pricey ultra-hightech phones and tabs is pretty much a legitimate ask. Yeah, maybe a few years down the road. But criticizing Samsung for putting 64GB instead of 0.5 TB is a bit far considering 64 GB is very high end these days. I don't about you, but I don't need to store about 500 movies on my phone at all times. 64 GB is a welcome addition. New SDXC Cards can hold up to 2TB. Happy with that? I'm sorry to say this, but Samsung is just so much more awesome than Apple for this reason. The thing they do make more sense. Apple, "here is iCould, you can store anything there." But I'm sorry, sometime I just don't have wifi or cell signal. On broad storage is important for this reason.